The history of abacus dates back to nearly 2500 years back. The Abacus is an ancient mathematical instrument used for calculation it is one of the world’s first real calculating tools. The word Abacus is derived from the Greek "Abax" meaning counting board and the original types of Abacus were stone slates with dust covering them and a stylus used for marking numbers. Later this evolved into a slate with groves where rocks or other counters would be placed to mark numbers. Later it finally evolved into a framed device with beads sliding along bamboo rods. 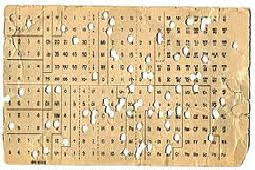 The original utilization of an Abacus related calculation system is presumed to have been in the form of a board covered with dust or fine sand.The sand was divided into lines, each one representing a different numerical position. Numbers and quantities were calculated by means of various signs drawn along the lines. The early civilization of Mesopotamia may have seen the development of such a rudimentary calculator. The period 2700–2300BC saw the first appearance of the Sumerian abacus, a table of successive columns which delimited the successive orders of magnitude of their sexagesimal number system. Some scholars point to a character from the Babylonian cuneiform which may have been derived from a representation of the abacus. It is the belief of Old Babylonian scholars such as Carruccio that Old Babylonians "may have used the abacus for the operations of addition and subtraction ;however, this primitive device proved difficult to use for more complex calculations". With time, the dust abacus developed into a ruled board on which pebbles or counters were placed on lines somewhat like checkers on a backgammon board. Its wide use in Egypt, Rome, Greece, India, and other ancient civilization is well attested. Herodotus (484 – 425 BC) most likely refers to aline abacus in his records : “The Egyptians move their hands from right to left in calculation, while the Greeks from left to right”. A famous example of the line abacus is the Salamis Abacus preserved at the Athens Museum. It consists of a white marble board (149 by 75 Cm) with lines drawn on it. 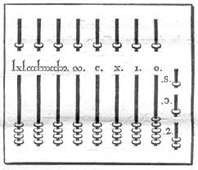 The use of the abacus in Ancient Egypt is mentioned by the Greek historian Herodotus ,who writes that the Egyptians manipulated the pebbles from right to left,opposite in direction to the Greek left-to-right method. Archaeologists have found ancient disks of various sizes that are thought to have been used as counters. However, wall depictions of this instrument have not been discovered,casting some doubt over the extent to which this instrument was used. During the Archaemenid Persian Empire , around 600 BC the Persians first began to use the abacus. Under Parthian and Sassanian Iranian empires,scholars concentrated on exchanging knowledge and inventions by the countries around them – India , China , and the Roman Empire , when it is thought to be expanded over the other countries. An abacus is a device used for addition and subtraction, and the related operations of multiplication and division. It does not require the use of pen and paper, and it's good for any base number system.There are two basic forms for the abacus: a specially marked flat surface used with counters (counting table), or a frame with beads strung on wires (bead frame). Even before humans could read or write, they needed to count. First they used their fingers, but when they had to deal with figures over ten, a counting device became necessary. Pebbles and bits of wood arranged on the ground were used to count goods and to figure prices. These were the predecessors of the abacus. abacist (s) ( noun ) , abacists (pl); A person who is skilled in using an ancient form of a calculator consisting of counters that are moved in a groove or on a wire to represent a variety of numbers.